When babies and children have ear infections everyone in the house suffers because they cry all night and no one sleeps. They hurt. Especially at night. Parents don’t want to see their children in pain and they don’t want to see it happen again and again, so they often wonder if tubes are the answer. What causes ear infections and what does not? A middle ear infection usually happens because of swelling in one or both of the eustachian tubes (which connect the middle ear to the back of the throat as pictured above). The tubes let mucus drain from the middle ear into the throat. If they are blocked, the mucus builds up in the middle ear. Ear infections are usually caused by viruses that cause typical cough and colds. The mucus made during the infection gets into the middle ear, causing pain. Bacteria can also get into the middle ear and cause infections. Why do babies get so many ear infections? The eustachian tube helps to equalize pressure in the middle ear. If it is swollen or blocked it does not allow the pus in the middle ear to drain (think of how the tissues in your nose swell with a cold or allergies). 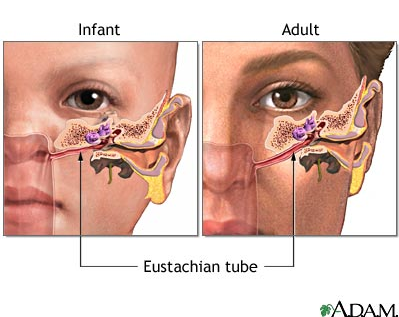 Infants and young children are more prone to ear infections than adults because their eustachian tube is flatter, which inhibits drainage (see picture below). 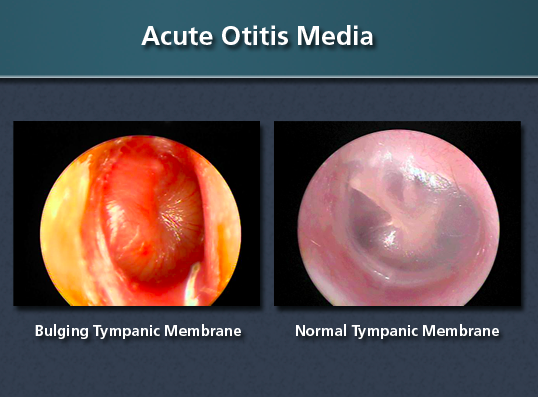 Correctly diagnosing an acute ear infection (otitis media, OM) can be more difficult than it seems. The child must have significant pus behind a red eardrum, as in the left image above, or pus draining out of the ear canal from pressure causing a hole in the eardrum allowing pus to drain (perforated eardrum) or ear tubes. Even with this pus and redness, it is not possible to tell if a bacteria or virus is causing the infection. If there is pus behind the eardrum without redness or other symptoms, it is not an acute ear infection but rather otitis media with effusion (OME). This fluid can range from clear to white or yellow and may accumulate in the middle ear as a result of an upper respiratory infection or a resolving acute ear infection. Many kids have no symptoms of pain with this ear fluid but it can affect hearing. OME is often found at “well” visits during the winter months or at school hearing evaluations. OME typically self resolves within a month or two. If it persists beyond 3 months and causes hearing loss, tubes will drain the fluid (see below). Sometimes removing the tonsils or adenoids are recommended, since removal might help the eustachian tube drain the middle ear. Decongestants and other medicines have not been found to help OME. OME can get mistaken for an ear infection if the child is crying during an exam, which reddens the eardrum. Many kids cry when being examined, and the eardrum can turn red just from crying (just like their face and ears turn red when they’re mad). We often see this when kids are in the office for upper respiratory tract infections. School nurses will sometimes send kids in to check on red ears. This is not an ear infection unless there’s also pus. It’s just a crying kid. Or a child with a fever and red ears. Many less experienced (or just busy) clinicians call it an ear infection even if there’s no pus so they can quickly write a prescription and move on to the next patient. Parents are happy “knowing” that there’s an ear infection (that’s not real) and that they can do something about it. This is incorrect on several levels. There must be pus involved. It’s easy to over diagnose an ear infection if you’re just looking at the color of the eardrum. Swimmer’s ear is a different type of infection entirely because it involves the skin of the ear canal, not the middle ear, and is covered in-depth in Swimmer’s Ear. When babies have pink eye I always want to look at their ears before treating the eyes. This is why I don’t recommend getting antibiotic eye drops by phone for young kids. Ears and eyes often become infected together and the ears should be treated in addition to the eyes, and the eye drops do nothing for the ears. I’ve seen plenty of kids over the years who have no ear symptoms with their ear infections – they just get red matted eyes, with or without fever. Are ear infections that rupture the eardrum more serious? I’ve had several parents worry that their child had a hole in the eardrum allowing pus to drain out. They automatically think this child is at higher risk of ear problems and should get tubes. This isn’t exactly the case. Many factors can lead to ear drum perforation (or rupture). In general, when the eardrum perforates, a hole allows the pus to drain (much like tubes), which allows for faster healing of the infection and pain. This does not necessarily mean the child is prone to ear infections or needs tubes. In days before antibiotics, a treatment for ear infections was to put a needle into the eardrum to draw the pus out. This helped relieve pain and was very effective to clear the infection. I find that many kids who have eardrum ruptures feel better faster than those who don’t. Occasionally the hole lasts for years and it becomes recommended to patch it closed, but typically the hole closes up very quickly — sometimes too quickly before the infection is cleared and pus re-accumulates behind the eardrum. So now that you know what ear infections are, check in tomorrow for Part 2: how to treat ear infections. Until then, you can check out these 7 Ear Infection Facts Every Mother Should Know from Dr. Deborah Burton, an ENT with a fantastic blog. I am an Ped ENT physician who sees kids after ear infections do not resolve. This is a fantastic overview of “ear infections” because there are actually many types and understanding which one your child’s physician is discussing will help you better understand the treatment options. The best treatment is prevention! I’ve actually linked some of your blogs to tomorrow’s post. Stay tuned! Previous Previous post: Flu Season Fears: What should you do?